Sidney Crosby will face the Washington Capitals for the first time since last year's Winter Classic on New Years Day, where he was on the wrong end of a hit to the end that ultimately caused him to be sidelined until late last month. The Pittsburgh Penguins (14-7-4) have gone 8-0-1against the Washington Capitals since the second round of the 2009 playoffs, including a 3-2 overtime loss in the team's first meeting of this season. However, with Crosby back in the line-up an already potent offensive has become that much stronger. Crosby recorded four points (2G,2A) in his season debut two weeks ago, and has grabbed 11 points in just five games played. The Capitals (12-10-1) are in the midst of a transition into new coach, Dale Hunter's, systems and will try to end a losing streak currently at three games. 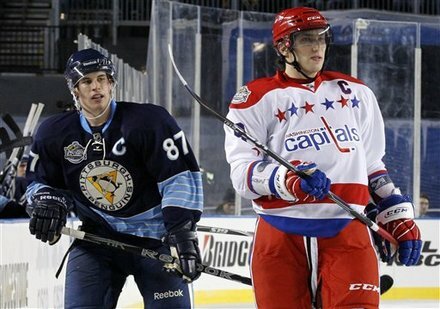 Crosby's recent success has shined spotlight on his counterpart, Alexander Ovechkin's, struggles. Ovechkin has scored just one goal in 12 home games, and has just 18 points on the season. Ovechkin has had some success against Pittsburgh, recording 19 goals and 33 points in 25 games against the Penguins.